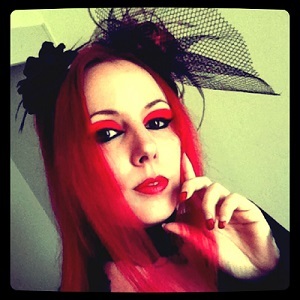 Festivalphoto asked artist Helcanen about her art and work for MFVF. Any fan who has attended the festival or has looked at the website will have seen her work. Read what she had to say below..
Festivalphoto: Hi Helcanen, you're the official artist for MFVF. What art do you create for the festival (what is it used on)? Helcanen: Hello Anthony. For MFVF, I mainly work as designer : website, posters/flyers and any other promotion for the festival, merchandise, etc. Sometimes I do some drawings or paintings, like the MFVF logo (Metal horn's woman), that are used for the festival's designs. Festivalphoto: How do you create your art - do you paint on paper, or are you an artist who works on computer instead? Even though some people say things to the contrary, you cannot get the same effects with a computer that you get with real painting, but of course, I need a computer for the design side. Festivalphoto: Are fans able to buy any of your art - for example at the festival? Helcanen: Yes, every year I try to make new merchandise, and since last year I now have my own stand at MFVF. You can also find big pictures and sometimes paintings for sale in the backstage area. Otherwise, people can order via the internet. Festivalphoto: How long does it take you to create one of your portraits of a singer? Helcanen: It's difficult to say, it depends of the material used, if it's with pencil or acrylic. A small one could be done in one afternoon. Festivalphoto: what is your proudest achievement as an artist so far? Helcanen: I'm really happy to see my artworks are famous all around the world! I've met and connected with some amazing people but i also think that my art also connect people between them. With my photography I capture moments that become amazing memories, for myself but also the bands and the fans, and more than anything im always glad to see my familly and friends so proud and happy! Festivalphoto: Are there any singers that you haven't painted yet but would like to? Helcanen: There are plenty, if I have time this summer, I should make few more portraits but I don't know which one yet.